Israeli Defence Forces are interested to buy American V-22 Osprey tiltrotor aircraft. The prospective new unit or, alternatively, a strengthened Shaldag (Kingfisher) airborne commando unit, would ultimately be integrated into the IDF’s planned Depth Corps, a joint special operations command expected to become operational this year. The IDF announced plans to establish Depth Corps last December, characterizing its “primary task” as “extending joint IDF operations into the strategic depth.” Elite units to be consolidated under the new command include Shaldag, Sayeret Matkal (General Staff Reconnaissance) and Flotilla 13. The joint special operations command and the prospective new unit, which would not become operational until later in the decade, come in response to the drastic increase in the number of special missions conducted by the IDF in recent years. 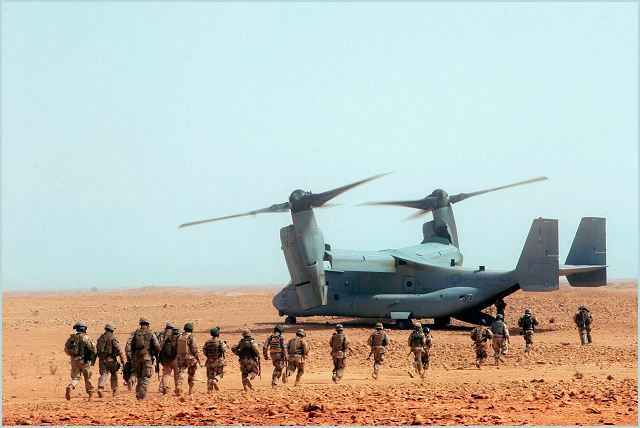 Over the past year, the Israel Air Force (IAF) has intensified its contacts with the U.S. Marine Corps and other U.S. counterparts on the V-22, and has sent pilots to fly the tilt-rotor aircraft. Earlier this month, IAF Commander Maj. Gen. Ido Nehushtan made his own flight in the V-22 from Hurlburt Field, Fla., home of U.S. Air Force Special Operations Command. In an interview last year, Nehushtan said the IAF was developing “a deep acquaintance” with what he called a unique platform. A U.S. source said the U.S. Navy and the Pentagon’s International Security Affairs bureau are encouraging Israel and other allies with operational requirements for the V-22, in large part to compensate for the 24 aircraft cut from the U.S. multiyear procurement plan. “No doubt, the V-22 will be a game-changer for Israel. ... It also will help contain unit costs that will grow since they cut us down from 122 to 98,” the source said of aviation procurement cuts in the Pentagon’s five-year-plan. The V-22 is built by Chicago-based Boeing and Textron’s Bell Helicopter unit.